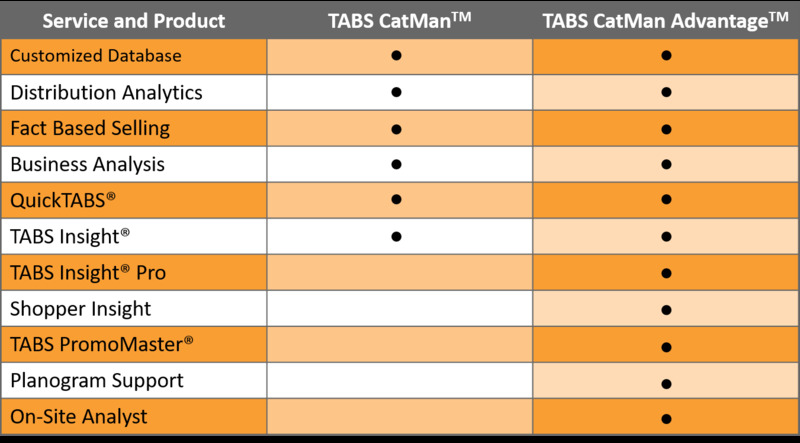 TABS CatMan Advantage provides an advanced suite of tools, software, and services that go beyond traditional CPG Category Management Software to allow you to dig deeper with pinpoint accuracy into specific drivers of your business. It gives you an advantage over your competitors by optimizing your own business as well as offering you tools that differentiate your company with the retailer. TABS Insight Pro™: TABS Insight Pro is an advanced version of TABS Insight™, a powerful cloud-based management dashboard with enhanced analytical capabilities. 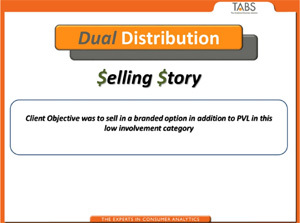 In addition to the topline overview and distribution based analytics provided by TABS Insight, TABS Insight Pro™ takes a deeper dive into the drivers of your business by understanding the impact of promotion and pricing. Shopper Insight: Not every issue in Category Management can be resolved with scanner data. Often we need to understand why things are happening to predict future trends better. Shopper Insights provided by TABS Analytics provide action-oriented, tactical insights that enhance your category management initiatives. For example, a recommendation to increase promotional support in one category was accompanied by a shopper survey that showed that less than 2% of category shoppers were aware of the retailer’s Everyday Low Price strategy, which had been in place for almost a year. TABS PromoMaster®: This is the only software solution that can effectively harmonize all the data required for a complete analysis of your trade promotion. Due to TABS AccuBase®, which is a much more accurate estimate of baseline sales, TABS PromoMaster is the only model that accurately provides the incremental sales of your promotions. On-Site Analyst: TABS Analytics will provide on-site support not only at your office but also at retailers, as needed. Retail Buyers give preferential consideration to companies that move beyond basic category analysis to help them better understand Shopper purchase dynamics and how to capitalize on them. TABS CatMan Advantage provides the full suite of support that today’s most sophisticated retailers require of their vendors. TABS Analytics' proprietary analytics and software solutions will give you an advantage above your competition, including large CPG companies, at a fraction of the cost. TABS CatMan Advantage provides the full suite of support that today’s most sophisticated retailers require of their vendors. For the cost of a senior-level Category Management resource, you will receive the senior expertise of TABS Analytics plus all of the unique analytical tools and software included in this cost-effective suite of services. This is a low risk solution that immediately elevates your category management efforts to the top tier of the industry.